Please refer to our stock # 11050 when inquiring. 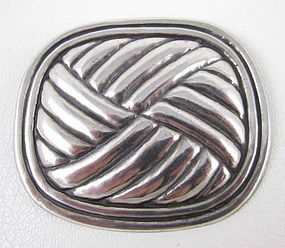 This elegant pin is a timeless design from the Taxco Maestro, William Spratling. It is commonly known as his "Petate" design and measures 3" long x 2 5/8" wide. It is an unusual repousse quilted design and is a hefty 66 grams. It is in excellent condition and the reverse is signed "Spratling Silver" with the circular "Spratling Made in Mexico" monogram hallmark.